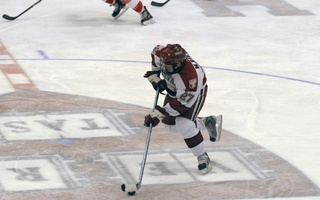 Fighting back from a 2-0 and then a 3-1 deficit, the Harvard men’s hockey team found itself within striking distance for the last nine minutes of the game, looking to upset No. 5/6 Quinnipiac Friday night at TD Bank Sports Center in Hamden, Conn. But the Crimson (2-4-1, 1-4-1 ECAC) could not find the equalizer, falling to the Bobcats, 3-2, and losing its fourth straight game overall and in ECAC play. With the win, Quinnipiac (10-1-1, 4-0-1 ECAC) remains undefeated in league play. The Bobcats jumped out to an early 2-0 lead, with freshman defenseman Brayden Sherbinin and senior forward Cory Hibbeler each netting a goal. Sherbinin’s goal came 6:30 into the game, assisted by Tim Clifton and Alex Barron; Hibbeler scored at 12:02 into the first, with help from Devon Toews and Barron. Part of Quinnipiac’s success this year has been its ability to get ahead early on the scoreboard, and again this was the case in the Bobcats' tenth win of the season. 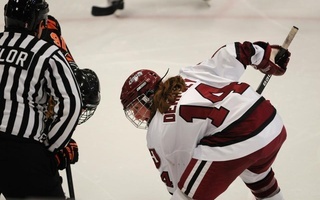 Harvard was able to cut the deficit in half in the second period, as the Crimson took advantage of a facemasking penalty and game misconduct from Quinnipiac senior Kellen Jones. Sophomore forward Kyle Criscuolo scored the lone goal of the period, at 12:39 with an assist from freshman forward Phil Zielonka in Harvard’s first of two power-play opportunities in the game. The Crimson and the Bobcats exchanged goals in the third period, and Quinnipiac was able to hold off Harvard’s late rallies. Jordan Samuels-Thomas put the Bobcats up 3-1 4:20 into the final frame. Sophomore forward Jimmy Vesey then made it 3-2 on a delayed penalty opportunity with 8:50 remaining in the game, with help from sophomore Brian Hart and freshman Luke Esposito. The Crimson could not put another puck past Bobcat goalie Michael Garteig, who had 31 saves on the night, 18 of which came in the third period—including one that was reviewed but ultimately ruled no goal. 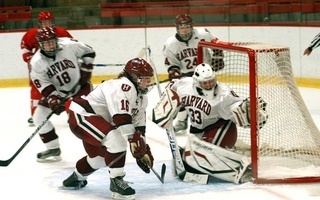 Harvard goalie, senior Raphael Girard, countered with 30 saves of his own. This defeat also marks Harvard’s second straight one-goal loss as it enters into a stretch of play that includes seven road games over its next eight. The Crimson will look to build upon this close loss to a highly ranked team as the season progresses. —Staff writer David A. Mazza can be reached at dmazza@college.harvard.edu. In their first time out in 2013, the Crimson (5-0, 1-0 Ivy) dominated from top to bottom and posted a perfect 9-0 win. For the Harvard women’s rugby team, Tuesday night’s opening match against Quinnipiac has been thirty years in the making. 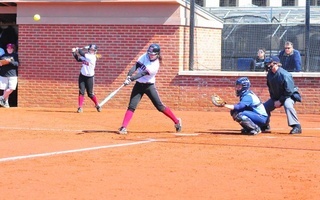 Having played for the last three decades as a club squad, this game will be the first time that the team’s members take the field as varsity athletes.